A lot of little girls dream of growing up to become a mermaid. Unfortunately, most of those little girls grow up to find out the harsh reality that you have to be born a mermaid to become one. It’s a pretty rough moment in any woman’s life, realizing that she’ll never be able to live out that dream she had as a little girl. Well, now with this pink mermaid fin skirt, no woman has to give up on becoming a mermaid. 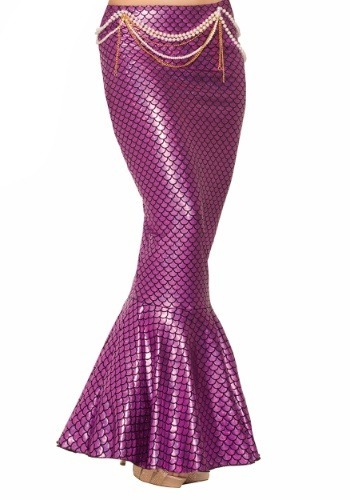 This fin skirt has a form fitting style that looks like a real mermaid tail. It’s made of a shimmering pink fabric that has scale printing all around it, so it’ll look like you just hopped out of the ocean. Since it’s just a skirt and not a REAL fish tail, that means you can still walk around on land unhindered, while getting a cute look based on the mystical creature and living out your dream of becoming a mermaid.